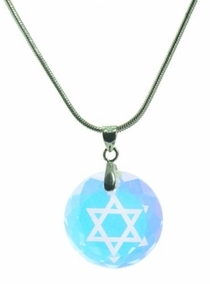 Kabbalah Necklace - Cabbalic Rainbow Glass Star of David Pendant Necklace. The Star of David or Shield of David is a generally recognized symbol of Jewish identity and Judaism. It is named after King David of ancient Israel; and its earliest known communal usage began in the Middle Ages, alongside the more ancient symbol of the menorah. Geometrically it is the hexagram. With the establishment of the state of Israel in 1948 the Star of David on the Flag of Israel has also become a symbol of Israel. The symbol is also associated with the Zionism movement. According to Judaic sources, the Star or Shield of David signifies the number seven: that is, the six points plus the center. "Seven names of angels precede the mezuzah: Michael, Gabriel, etc. ... Tetragrammaton protect you! And likewise the sign, called the 'Shield of David', is placed beside the name of each angel." The Menorah on the Arch of Titus: notice the three stems on each side plus the central stem, totaling sevenThe number seven has religious significance in Judaism, e.g., the six days of Creation plus the seventh day of rest, the six working days in the week plus Shabbat, the Seven Spirits of God, as well as the Menorah in the ancient Temple, whose seven oil lamps rest on three stems branching from each side of a central pole. Perhaps, the Star of David came to be used as a standard symbol in synagogues because its organization into 3+3+1 corresponds to the Temple's Menorah, which was the more traditional symbol for Judaism in ancient times. There are also six words in the Shema, the most important prayer in Judaism, and it is not uncommon to find the Shema written around a Star of David.